On one page on Monday, The Washington Examiner published three articles that demonstrate massive failures of U.S. foreign policy. First, Iraqi cleric Muqtada al-Sadr’s call to halt military operations vindicates anti-war voices in Congress, specifically Rep. Ron Paul, R-Texas, who has argued since 2003 that the violence against Americans in Iraq would end if the United States made a credible promise to withdraw. Second, while the president has already had his “Mission Accomplished” moment in Libya, the civil war there rages on.The fact that the country’s deteriorating state was precipitated by NATO attacks will naturally result in more anti-Americanism. But when the next terrorist attack happens, you can be sure it’ll be blamed on radical Islam, not a flawed foreign policy. Finally, the truck bomb that wounded dozens of U.S. soldiers in Afghanistan should remind Americans that war is a continual incentive for terrorism and only peace can make America safe once again. 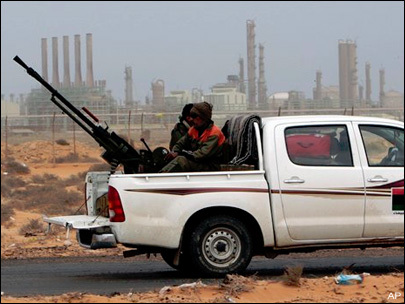 In a similar vein, Amnesty International is accusing the Libyan rebels of war crimes. Just who are we supporting over there? By the Numbers: What about Terrorism in Eastern Europe? Terrorism in Eastern Europe has had the opposite trend of Western Europe. Do Colleges Really Discriminate Against Men? Maybe in some cases, but overall, male students benefit from affirmative action. By the Numbers: Is the US Under-Policed? The Council of Economic Advisers says the US has 35% fewer police than the world average; really?! 11 Incredible Findings from the Report on Baltimore PD This isn't America; it's Baltimore. Police vs. Prisons in the US and Europe Six charts!